We are always committed to the safety and health of children's clothes. The Eco-healthy and good quality fabric for a comfortable touch is our goal. Size Chart: Please ignore the tag size, we already converted to be U.S size. US 2Years = Tag 90 fits for height 31"-35"
US 3Years = Tag 100 fits for height 35"-39"
US 4Years = Tag 110 fits for height 39"-43"
US 5Years = Tag 120 fits for height 43"-47"
US 6Years = Tag 130 fits for height 47"-50"
US 7-8Years = Tag 140 fits for height 50"-53"
US 9-10Years = Tag 150 fits for height 53"-56"
US 10-11Years = Tag 160 fits for height 56"-59"
US 11-12Years = Tag 170 fits for height 60"-63"
If your kids a little bit thinner or stronger, please check detailed measurement and select cautiously. A warm reminder: If you un-satisfy with your purchase from us, pls contact us freely, we promise to give you satisfactory solution within 12 hours. *New design, produced with High Quatlity Workmanship. Premium quality, great for kids: 100% premium-grade,superior soft flannel,lint free,Eco-friendly and Skin-friendly,without itch or scratch. Reasonable design, protect kids from getting cold: There is a button on the neckline,which can make kids wear the barthobe well, kdis will not get cold after taking a shower or at home. A great choice for kids: made of flannel,very soft and warm in winter. Kids can wear this as bathrobe,homewear,housecoat and beach robe. Kids will love this bathrobe with its lovely design. Four Seasons Homewear, Practical and Durable: Can be use in all seasons,no matter it's autumn,spring or summer. 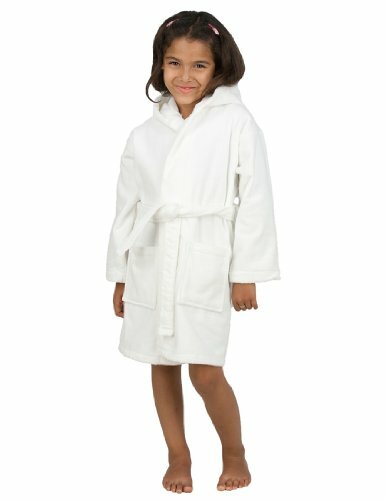 This bathrobe can be worn in air conditioned room in Summer, very soft touch for kids. 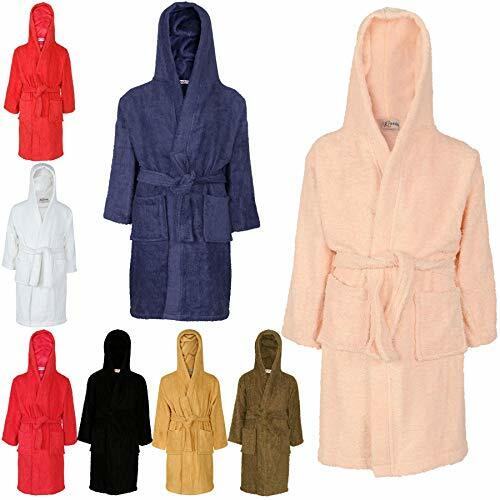 Affordable price with risk-free guarantee service: Selling high quailty bathrobe and offering great after-sales service is our ompany's principle.Thus we have Money Back Guarantee,No worries after purhcasing from us.Just don't hesitate to contact us if you have any questions or Dissatisfaction about this bathrobe. We will work with you till you are satisfied! It keeps the girls cool and comfortable while "getting ready", applying their makeup and blow drying their hair. 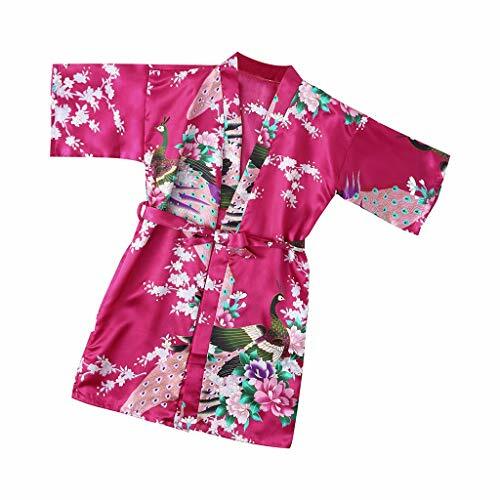 A perfect match with women's kimono robe. Flower girl robe,junior bridesmaid robe. If you're planning a SPA PARTY to include Oatmeal Facials with cooling cucumbers and Mani-Pedis, the lovely robe makes your "Little Ladies" truly special and pampered. Can also be worn at home as a lounge robe or bathrobe, or as a light wrap jacket on warm days. Great robe/dress gift for spa party, baby shower,bridal/wedding party and dress up events. Slightly differences in color may happen due to color reflection in the monitor, lighting, background etc.? TowelSelections boys' hooded cover-up is soft and comfortable. These kids cover-ups are terry cloth interior and exterior and they are made of 100% Turkish Cotton. They are soft, absorbent and also cozy and elegant. Hooded boys' cover-up is only for beach and pool use. It is not intended to be used as sleepwear robe or sleep related activities. Size 4 (X-Small) For kids 37-42 lbs weight, 42-44 inches height. Size 6 (Small) For kids 46-53 lbs weight, 48-49 inches height. Size 8 (Medium) For kids 65-72 lbs weight, 50-53 inches height. Size 10 (Large) For kids 73-81 lbs weight, 54-57 inches height. Size 12 (X-Large) For kids 82-83 lbs weight, 57-59 inches height. HOODED TERRY COVER-UP - Hooded terry cover-up for kids is cozy and elegant. It is double stitched for durability. Boys' hooded cover-up is soft, absorbent and comfortable. Featuring front pockets and a belt. PERFECT GIFT - Boys' hooded cover-up is the perfect gift for your loved ones. Great for bath, pool and beach. This robe will keep kids warm and conserve body heat. Five sizes available. MADE IN TURKEY - Boys' hooded cover-up is made of 100% Turkish Cotton. Machine washable, wash in warm water. Tumble dry low heat. CONFIDENCE IN TEXTILES - We believe in all our products. Our products are tested for harmful substances according to Oeko-Tex Standard 100. Hooded boys' cover-up is only for beach and pool use. It is not intended to be used as sleepwear robe or sleep related activities. 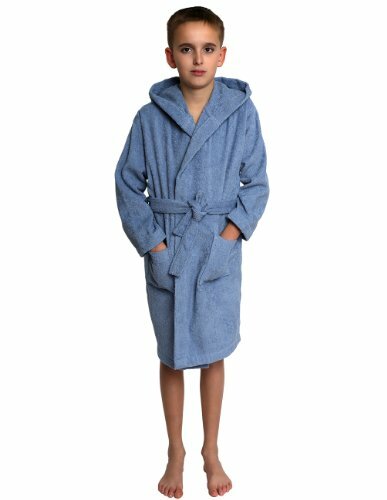 No matter your age you can get a lot from a bathrobe and we can help you find the right size and style. TowelSelections hooded kids cover-up is soft and comfortable. These girls' cover-ups are terry cloth interior and exterior and they are made of 100% Turkish Cotton. They are soft, absorbent and also cozy and elegant. Hooded girls' cover-up is only for beach and pool use. It is not intended to be used as sleepwear robe or sleep related activities. Regular Machine Washable;Tumble dry low;Dry clean recommended. Wonderful birthday present for son, daughter,granddaughter and friends. size 4 : Breast 27.55"---Length 24.41"---Sleeve 6.30"---Child Height 31.5-35.4"
size 6 : Breast 29.92"--Length 26.77"---Sleeve 6.69"---Child Height 35.4-39.4"
size 8 : Breast 31.5"---Length 29.13"---Sleeve 7.87"---Child Height 39.4-43.3"
size 10: Breast 34.65"---Length 31.5" ---Sleeve 8.27"---Child Height 43.3-47.2"
size 12: Breast 37" ---Length 33.86" ---Sleeve 9.06"---Child Height 47.2-53.1"
size 14: Breast 40.16"---Length 35.43" ---Sleeve 9.45"---Child Height 53.1-59.9"
Slightly differences in color may happen due to color reflection in the monitor, lighting, background etc. If you have any problem about the products, please feel free to contact us. Thanks. All Aibrou products are offered under registered trademark and protected by International copyright laws. plase check you buy from Aibrou. 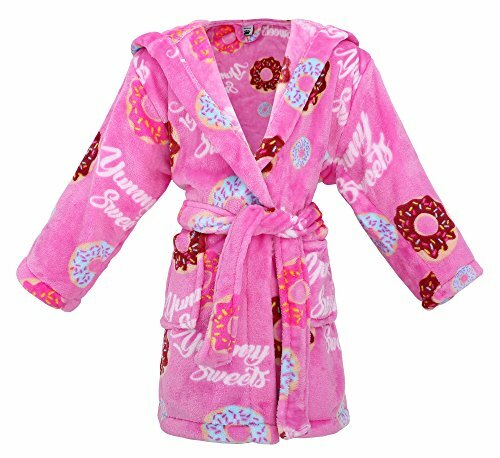 Girls JoJo Siwa Dressing Gown. Siwanatorz will go crazy for this sensational gown inspired by Dance Moms' JoJo Siwa! Featuring an all over print of her iconic bow, with her name in fun embroidery against a vibrant fuschia background this super soft bath robe is one for wrapping up in after taking to the dance floor. Soft and cosy JoJo gown to wrap up in after taking to the dance floor! Material:100% Polyester Satin. Imported. Luxurious silky feel and look, lightweight and comfortable. Adjustable/removable belt.sash tie closure and belt loops and INSIDE TIES. Tips:Dry clean or machine Wash in cool water with like colors gentle cycle, tumble dry low. 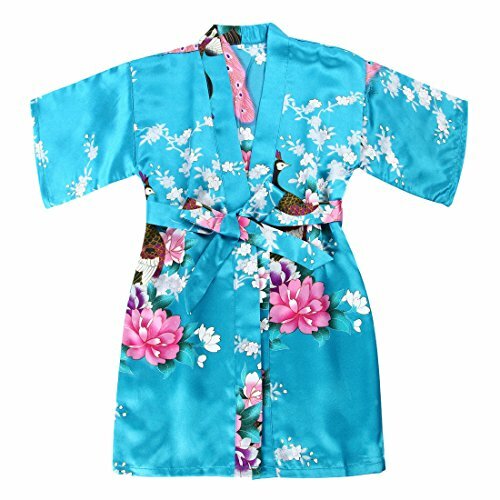 Pamper yourself and relax in this soft,satiny kimono robe. It can be worn at home/hotel/spa club as a lounge robe or bathrobe, or as a light wrap jacket on warm days. Shop With Confidence Simple Returns 30 Days Returns/Exchanges Accepted All Orders Dispatched Within 24 HOURS With Free Standard Delivery Here Are New Kids Girls Boys Designer's Towelling Bathrobes Soft Short Hooded Cotton Terry Bath Robe Dressing Gown Loungewear. Soft Cotton Material Towelling Belt 2x Deep Pockets On Front. Attached Hood For Extra Warmth And Cosiness. Extra Absorbent Keep You Warm & Dry Faster Luxury Soft Comfortable Bathrobe. Modern And Cute For All Boys & Girls Available Sizes; 3-4 Years, 5-6 Years, 7-8 Years, 9-10 Years, 11-12 Years & 13 Years. Available Colors; Baby Pink, Black, Brown, Navy, Pink, Red, Stone & White. A Nice, Great & Perfect Gift For All Kids Thanks For Looking. Check Out My Other Items! 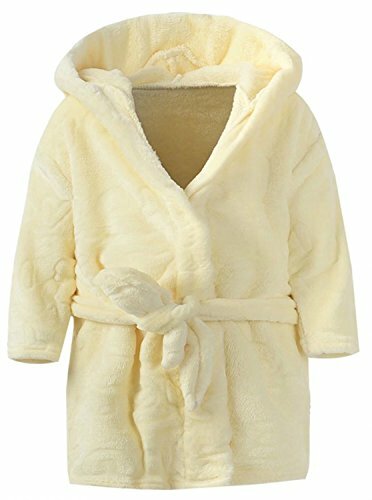 Cotton Soft Terry Material, Hooded Bathrobe, Towelling Belt, 2 x Deep Pockets On The Front, Extra Absorbent, Keep you Warm & Dry Faster, Luxury Soft Comfortable Bathrobe. Available Sizes; 3-4 Years, 5-6 Years, 7-8 Years, 9-10 Years, 11-12 Years & 13 Years. Available Colors; Baby Pink, Black, Brown, Navy, Pink, Red, Stone & White. A Perfect, Nice, Great & Trendy Gift For All Kids. A2Z 4 Kids Kids Girls Boys Luxury Cotton Hooded Towel Bathrobes Soft Terry Towelling Robes Dressing Gown Comfortable Soft Loungewear. 1. Size was measured by manually, please allowed 1-2 inch error. 2. Due to different monitors, the color may be a little different.If you are not sure about the color and size, please feel free to contact us. 100% Satisfaction Guarantee. Unconditional Refund. If you have any other question, welcome to contact us! 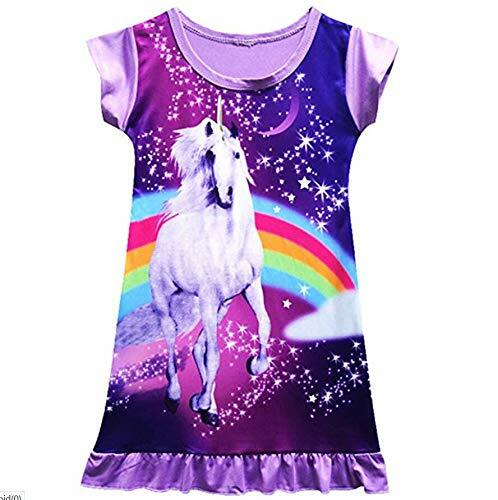 Package and Fabric : Include 1 unicorn sleep dress and 1 FREE unicorn sleep mask in RANDOM PATTERN. Our sleep dresses use the super soft breathable pure polyester. So every night you can enjoy restful, comfortable, sweat-free with these girl's nightshirt. High Quality : the polyester sleepwear with great stitching, perfectly-lined hems, and the highest quality printing make the sleepwear colorfast and shrink-proof. Size: stretchable polyester(size runs small, please order a larger size. for example, if you fit size 110, please order size 120). WASHING : this nightie can machine washable wont be shrink. feel free to place your order any problem you can contact us.
" 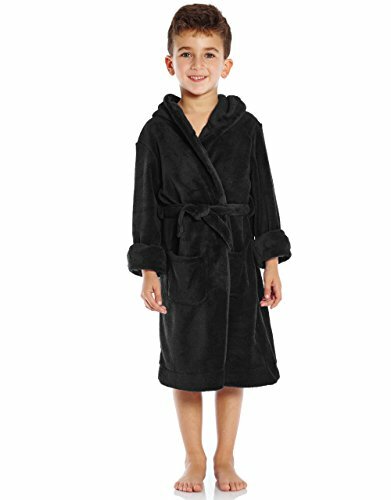 JuneBloom Girls Boys Fleece Hooded Bathrobe f ashionable design and never goes out of style. About Us : We have many years experience on producing Baby clothes, we always focus on the comfortableness and uniqueness of baby clothes.Our products allow babies to discover the world at their own pace, and also help parents to keep their baby comfort and cute. We hope your little one likes our clothes. If you have any question with your order, please be free to contact us. 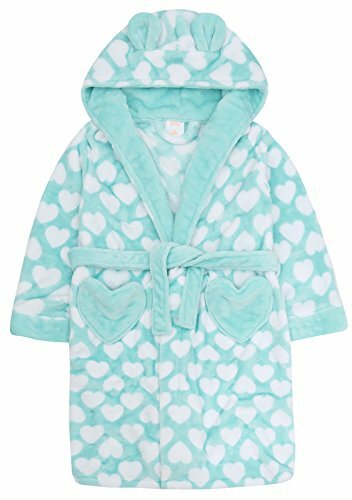 It's great for Sleeping, after bathing, your baby will love being snuggled in this warm bathrobe no matter it's autumn,spring or summer. This bathrobe can be worn in air conditioned room in Summer. Warm Tip : Please note that minor color difference would be unavoidable and reasonable due to light environments and screen. Washing Instruction : Hand and machine wash available.For best results, rinse and line dry immediately after use. Package included : 1 x Cute Bathrobe. Material:100% premium-grade,superior soft coral flannel,lint free,Eco-friendly and Skin-friendly,without itch or scratch.Premium quality, So even after multiple washes, the vibrant colors and feel of the fabric remains in beautiful condition.Great for kids. Fashionable Design:Wonderful workmanship and well cutting and sewing. Animal style with hat, cute and adorable.Kids can wear this as bathrobe,homewear,housecoat and beach robe. Kids will love this bathrobe with its lovely design. Four Seasons Homewear, Practical and Durable: Soft coral flannel hooded robe 100% brand new can be use in all seasons,no matter it's autumn,spring or summer. This bathrobe can be worn in air conditioned room in Summer, very soft touch for kids. Size:To fit your kids well, please choose the size based on left size chart picture(the last picture) of the website. Warranty: Order it now as a perfect present for your son, daughter, kid, or friend. Give this pajama set as a thoughtful gift for your loved one's next birthday or for Christmas., you will enjoy a 30-day money back guarantee. Any question, please feel free to contact us. 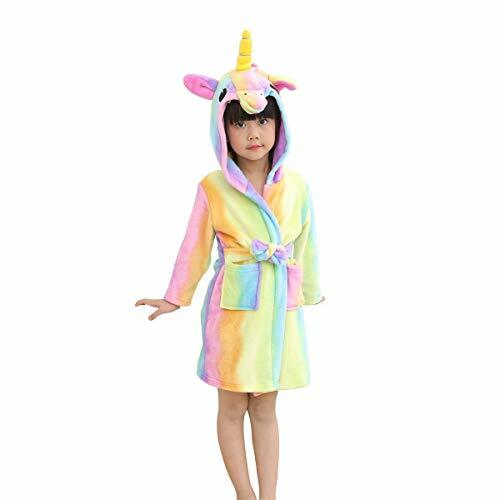 GIRLS LUXURY SOFT FLEECE BATH ROBES A luxury full length, fleece dressing gown. Each robe comes with a tie belt to allow the perfect fitting every time. 100% Polyester and machine washable. The first design is a heart themed robe with a hood and 3D ears available in Pink, Aqua or Lilac. The second design is a star themed robe with a hood available in Pink or Navy. The third design is hooded and features a sequin slogan detail to the back of the robe. Available in 3 colours. The fourth design is a colourful sherbert ombre pattern with a hood. The fifth design is a snuggle robe with a hood available in Pink or Aqua. The sixth design is a unicorn themed with a hood available in Pink or Aqua. Perfect as a Birthday or Christmas present. The robes are available in sizes 2 -3 to 13 years. 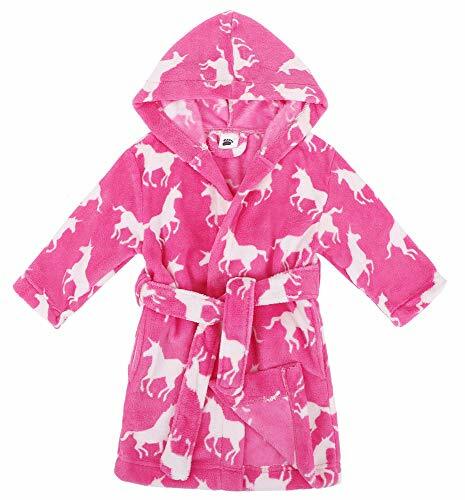 Girls snuggle fleece dressing gown. The robes are available in sizes 2 -3 to 13 years. Please note that slight color difference should be acceptable due to the light and screen.